Today, I was surprised. Middle son came home that brought me something. “Thanks for the great help I would like to give you this little gift” – he said. 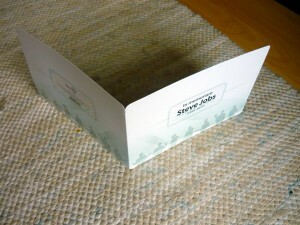 A philatelic novelty in memory of Steve Jobs issued by Hungarian Post. I was so happy for it. For years, I use Apple’s computers and other Apple’s products. I do not consider myself to a big Apple’s fan, but I experienced and loved the world that Steve Jobs and his staff created. Thank you! 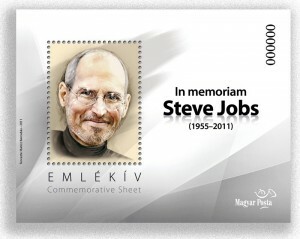 Hungarian Post is issuing a philatelic novelty in memory of Steve Jobs. The numbered commemorative sheet includes a perforated photograph and has been issued in a limited edition. The commemorative sheet will be available in a special holder for collectors of philatelic rarities and people who wish to preserve the memory of the visionary genius. 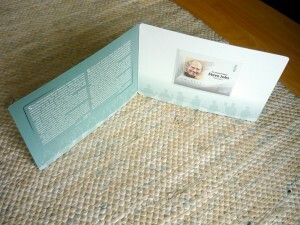 The perforated design of the commemorative sheet features a portrait of Steve Jobs. On the right of the border design there is the inscription “In memoriam Steve Jobs 1955-2011” and at the bottom left the inscriptions “EMLÉKÍV” and “Commemorative Sheet”. The numbering is printed vertically at the top right and Magyar Posta’s logo at the bottom right. The commemorative sheet can only be purchased as part of the commemorative card placed in a Hawid mount. The external and internal sides of the commemorative card are decorated by silhouettes of certain movements characteristic of Steve Jobs, while on the inside there is an extract from the writing of Ernő Rubik in Hungarian and English. 5,000 copies of the commemorative sheet and commemorative card, designed by Barnabás Baticz, were printed in the state printers Állami Nyomda and the printing works Con-X. The perforated size of the portrait within the commemorative sheet is 40 x 31.5 mm and the external imperforated size is 90 x 70 mm. The commemorative sheet cannot be used to pay for postage. The Hungarian postal service, Magyar Posta, is issuing a commemorative sheet bearing Steve Jobs image. The sheet, which includes a perforated stamp-sized image of Steve Jobs, will sell for 1,000 forints (about $4.40). From the Associated Press: The sheet includes a perforated portrait of Jobs, while an accompanying card shows silhouettes of some of the inventor’s characteristic poses and a quote about Jobs by Erno Rubik, the Hungarian architect who created Rubik’s Cube and other mechanical puzzles. “So much could be know about Steve Jobs as unbounded interest has surrounded his inspiring life’s work worldwide. All the same, there is nothing very tangible to point to if we want to explain his achievements which today affect everyone’s day-to-day lives. He was a workaholic, an iron-willed manager. For him, success never meant that he could d rest on his laurels; rather it was a new possibility for a new beginning. Jobs lived up to the challenges time and again. He recognized and formulated with extraordinary taste and good judgement needs which were then euphorically confirmed by an ever expanding audience. This audience today numbers several billion souls. All this only came about because Jobs’ achievements discovered things about the way the world works that seemed obvious the instant he them out. There were no obstacles to Steve Jobs’ personal worldview becoming communal and there was no need to wait for centuries for his brilliance to be recognised. He was a visionary but not a prophet.